WARNING: This blog post includes vulgar language. Somebody else’s. Not mine. Avert your eyes from the image below if you are easily offended. Slip ups in social media that create embarrassing – and sometimes damaging – consequences are all too common. Another one occurred last Friday affecting StubHub, eBay’s online marketplace for tickets to sporting events, concerts and shows. I read about it in Adweek, thanks to my colleague, Chuck Beeler, one of the leaders of EMA’s Social Media Advisory Group. I’ll summarize the story, although it’s a bit like watching a rerun of one of your favorite old TV shows. You know how its going to end, but you love seeing it anyway. 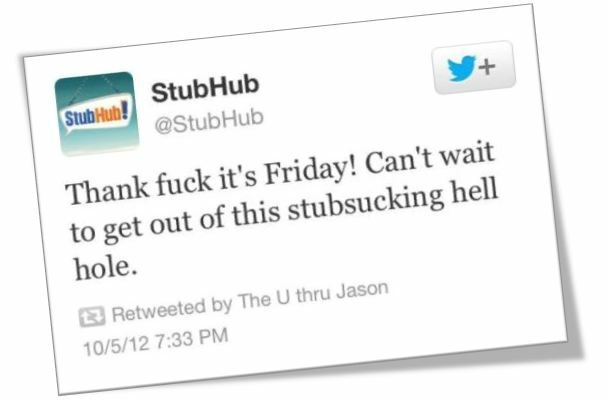 Of course, this employee intended the declaration for a personal handle, but mistakenly released it on the official @StubHub Twitter feed reaching its 19,000 or so followers. Oops. Tim’s advice is sound, but I think it misses the bigger mistake that was made. What made the StubHub Tweeter think for one second that this disparaging post was a good idea even from a personal social media profile? The critical message for public relations counselors is this: nothing is personal in social media. This is especially true for front line social media managers, but I believe this reality goes well beyond that. If you have a career you care about or a company you are accountable to, forget any notion that what you do in social can be personal. Accept this truth, and you’ll never need to worry if you picked the right profile in your HootSuite account when you upload a post. And you’ll surely avoid throwing a social hand grenade that bounces back at your company and you. P.S. 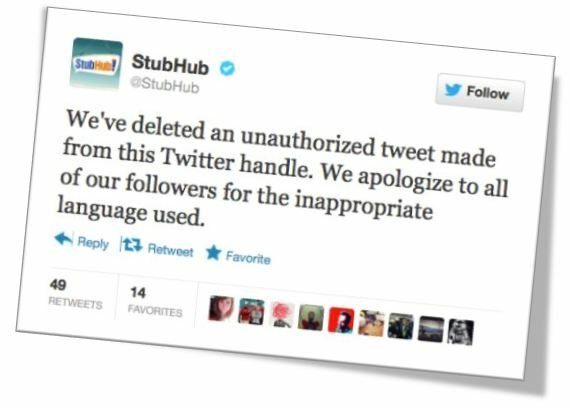 If you’re wondering how StubHub extracted itself from this social fiasco, they deleted the Tweet and acknowledged it in a follow up Tweet shown below. Good recovery. More posts like the first one, though, and StubHub might be able to start selling tickets to follow them on Twitter.